There are over 5 million people who have used Invisalign to align their teeth. Today, Invisalign has done nothing but increase in popularity because their braces are unnoticeable and easy to use. You can look and feel confident wearing them and doing your daily activities without anyone knowing you have them on! However, Invisalign can be quite pricey. In order to really maximize your benefit (and your investment! ), you need to learn a thing or two about maintenance and how to take care of your Invisalign. Invisalign works best when you know how to maintain and care for it. Most people think that because aligners are replaced after a few weeks, they can easily forego proper care. They are absolutely wrong. Keep reading for tips and tricks on how to take care of your Invisalign. If you want to avoid discoloring your Invisalign or deforming them, you need to get tips on proper care and maintenance. This not only extends the life of your Invisalign but also makes sure that the treatment is effective. This is a mistake that most people make when it comes to Invisalign. Invisalign is made out of plastic, so they are pretty malleable and may be deformed if not taken care of correctly. Remember that the Invisalign is there to not exactly fit your teeth perfectly, but to carefully align them. Biting into your aligners to fit them will deform your Invisalign and prevent it from doing its job. If you want to put on your Invisalign, align them first and then use your fingers to apply gentle pressure on your molars. 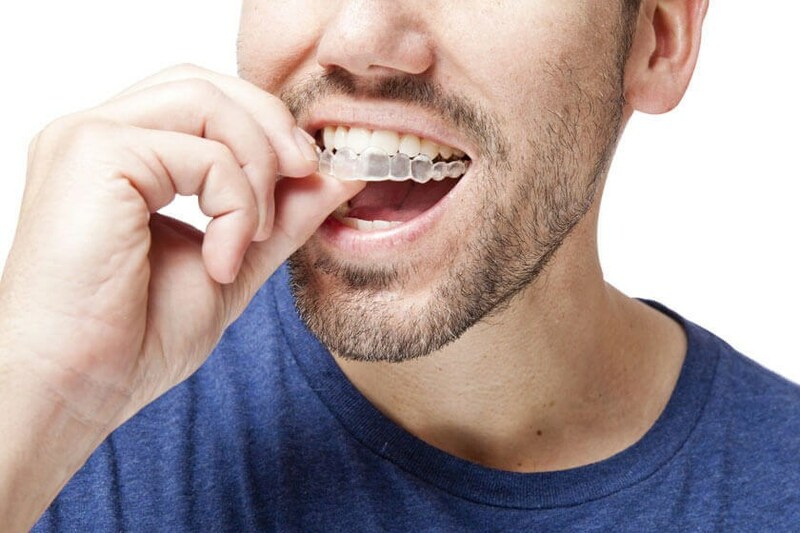 This will snap your aligners into place. Don’t be too rough in removing your aligners either. Always remember that learning the best way of removing your Invisalign will help prolong its use. To do this, use your fingers to pull the Invisalign out starting at the inside of your back molars. The Invisalign can be worn while drinking water but drinking any other fluid or eating food is not advisable. Your aligners may easily be stained by food and beverages. After eating, make sure to brush your teeth before putting them on to avoid contamination and discoloration of the inner lining of your aligners. Use only a soft toothbrush and a toothpaste or an Invisalign cleaner to gently clean the inner and outer parts of the aligners. Avoid using mouthwash or denture cleaners as they may be too harsh and could result in deforming or discoloring your Invisalign. After cleaning, you have to make sure that it will not be a breeding ground for germs later on. Avoid putting them near the sink or in any open space that can be easily contaminated. Place them in airtight containers when not in use. Thinking of getting an Invisalign for your best smile? Contact Smile NY today! We are a team of professional orthodontists who specialize in helping our clients get their perfect smiles.